Your bite (occlusion) is the foundation of dentistry. Occlusion is affected by a triad of factors — the teeth, the muscles and the temporomandibular joints. Traditional dentistry has focused on the teeth — what might be called “one-dimensional” dentistry. Neuromuscular Dentistry (NMD) is a term that has been applied to the additional consideration of the “second & third dimensions” — muscles and TM joints. Neuromuscular dentistry works with the hard tissues (teeth, bones) and the soft tissues (muscles and nerves) to place the jaw into its optimal position, relieving symptoms associated with the TMJ. These symptoms are often associated with temporomandibular joint dysfunction (TMD). People who suffer from TMJ pain often have an imbalance between the muscles, joints and teeth, which is caused by a bad bite (malocclusion). 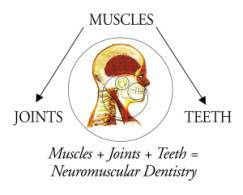 In Neuromuscular dentistry, the dentist understands that the relationship between the hard and soft tissues is complicated and works to restore balance to the system. Dr. McGrath begins with a comprehensive evaluation and develops an individualized plan to correct and realign the jaw. The section on neuromuscular equipment will familiarize you with many of the diagnostic tests Dr. McGrath uses. Why is my bite “off”? How did this happen? Many oral habits are correctable and since these habits affect the growth of the jaw and the eruption pattern of the teeth it is important to correct the habits and retrain the muscles at the earliest possible age.